Fringes, those dangly things are on just about anything we will be wearing this fall - gloves, shoes, boots, coats, jackets, scarves and what I like to wear, cosy sweaters. It's easy to upgrade a plain old sweater or cardigan into something special.Thread through yarn, leather strips, fabric strips or anything pliable and knot it. Voila, you have fringe. If you're thinking that it has to be perfect and even, think again...read on and see examples that will inspire you to try putting fringe in places you may have not thought of. 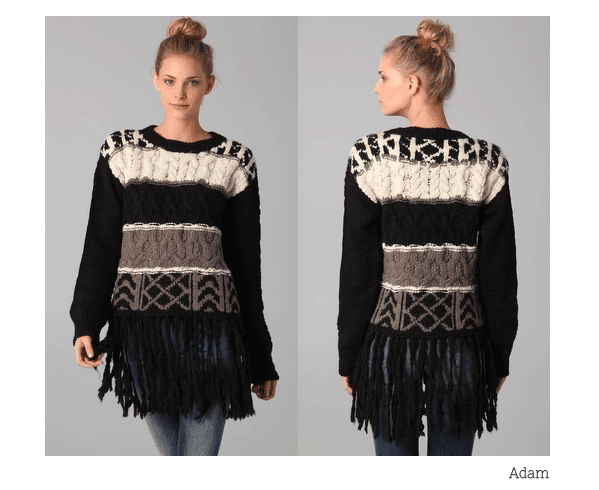 Fringe around the front and back shoulder of the sleeve. The yarn is pulled through a stitch and knotted. 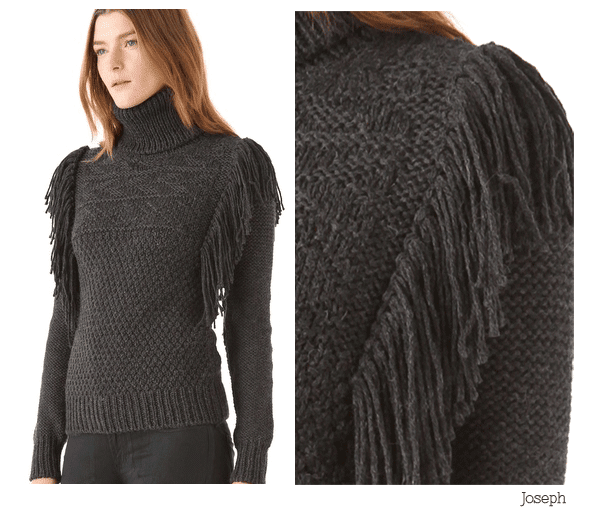 The fringe here has been added on the sleeves. The yarn used is thicker and ropelike, contrasting the yarn used in the body. 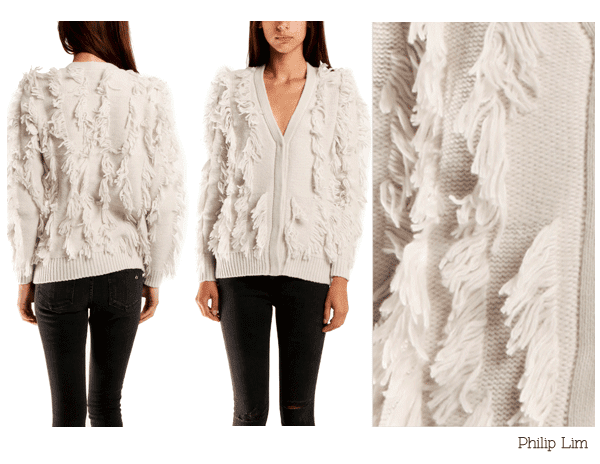 The thick, ropelike yarn adds dimension and gives the effect of fur. 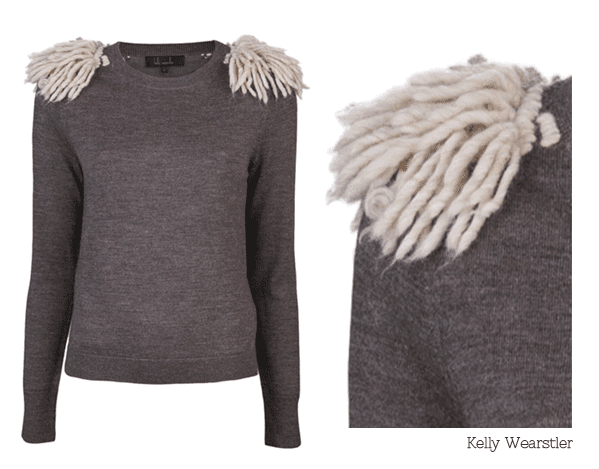 The epaulettes on the sweater have been made with fringe. The garment is a fine guage knit, in contrast to the woolly lopi yarn usually used in outdoor pullovers and cardigans. Again, the contrast adds to the texture and style. Strips of different weights and kinds of fabrics have been threaded through the holes in the hem of the garment. The strips are knotted at the ends. This method has enriched the garment with colour and pattern. 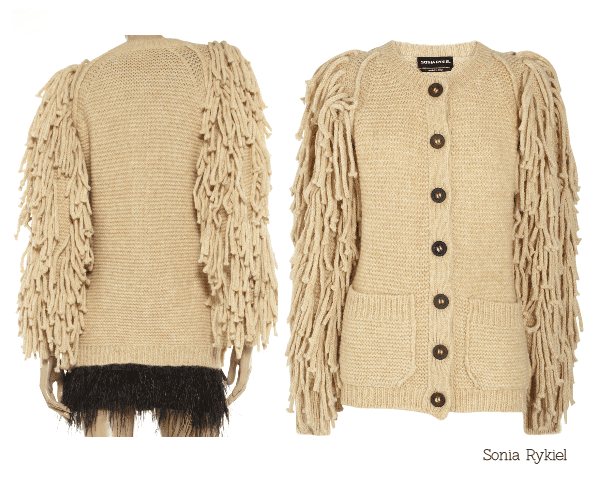 Using the same colour for the fringe and garment allows for the fringe be playful without being too obvious. 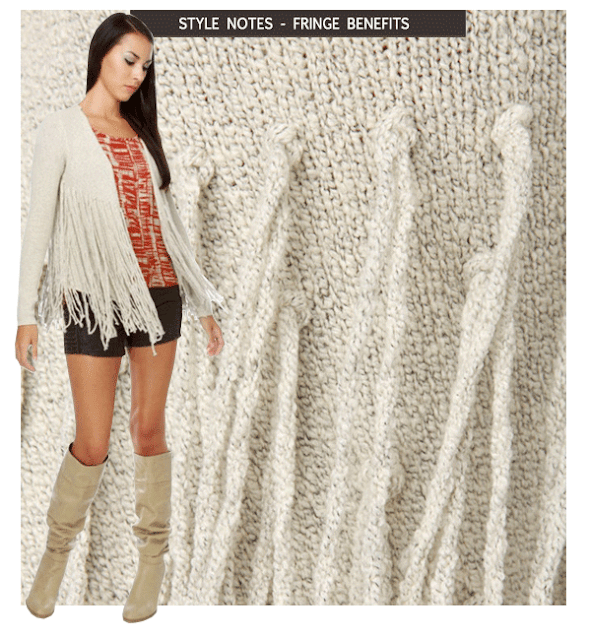 Here the fringe is in randon stripes in different lengths. 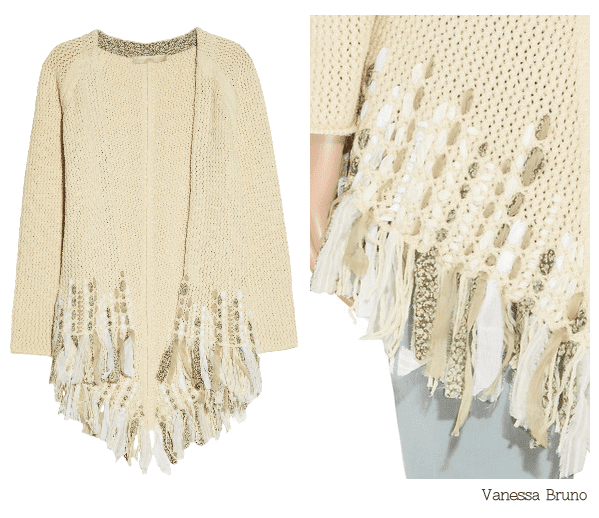 Adding length to a finished garment can be tricky, but the addition of long fringe to the bottom of this garment in the same main colour gives the illusion of length. Have any of you used fringe in a clever, creative way? Please let me know. About 5 years ago I was making a multicolored scarf for a friend. I wanted to do something different so I decided to add fringe throughout the scarf, not only at the ends. She loved it. Then she did her triloom weaving and made a stunning piece with random rows of fringe. Sandra's Stitches on Pinterest, if you'd like to see her piece. I'm glad to see that I was not the only person to think of adding fringe in the body of an item and not just at the usual places. Where have you been all my life. Such quality in everything you do. Wonderful and I am deeply appreciative of the work involved in presenting your posts. You rule. Thank you so much Peta, I'm truly happy that you enjoy reading the posts. It is comments like yours that make all the work worthwhile.